As a follow up to the Norwegian Epic of 2010, Norwegian Cruise Line launched a new two-ships class after the order for two sisterships of the former ship came to nothing because of problems between the line and the yard. With a tonnage of 145.000, the new ships were somewhat smaller then the Norwegian Epic, that measures some 10.000 tons more. But smaller is in this sense not really important, I guess, the new class is still very, very big. 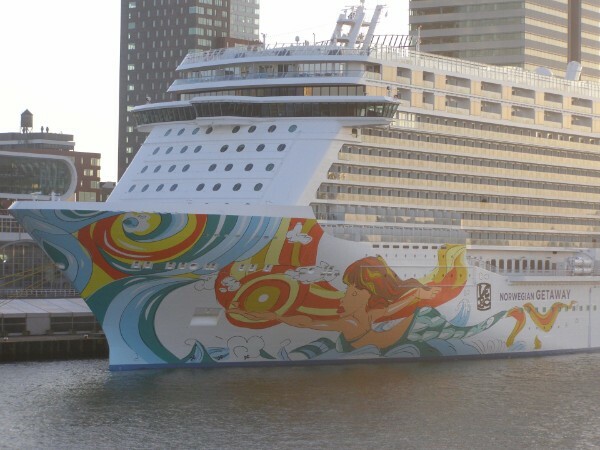 Above, Norwegian Getaway gets away from Rotterdam at the 13th of january 2014. Shie visited the greatest port in Europe twice in a few days time, just after she was delivered to Norwegian Cruise Line. 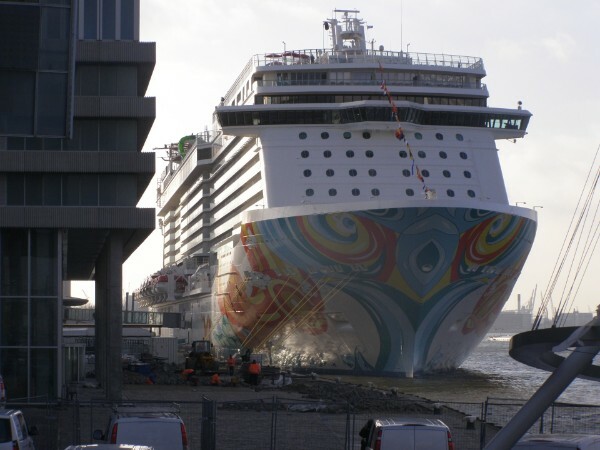 On the 30th of october 2012, the keel for the Norwegian Getaway was laid in the large building shed of Jos L. Meyers's wharf at Papenburg, northern Germany. She was the youngest sister, following Norwegian Breakaway, the name-giver of the class. Almost exactly a year later, on the 2nd of november 2013, the ship was floated out and she was completed in the following months. During the building of the ship, a fire broke out at the 5th of march 2013. Nobody was injured because of it and the delivery date was not affected too. What was affected was of course the building shed and the visitors center, that were both evacuated for safety reasons. 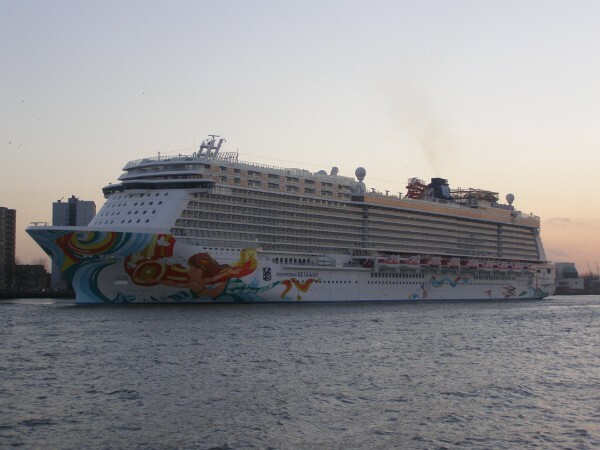 Norwegian Getaway got her name from a competition called 'Norwegian cruising for names', that was organized by NCL together with the USA Today newspaper. Out of a selection of 230.000 submitted names for her and her earlier sister, a man named Dennis Hultman from Virginia was the lucky chap whose submitted name was chosen. Getaway, in accordance to NCL, means 'a place where one escapes for relaxation, vacation etc.'. Sio its exactly what a large cruiseliner should be. The ship measures some 145.655 tons and she is 325,70 meters long, 39,7 meters wide and her draft is 8,30 meters. Her total passenger capacity is 4500, based on two-per-cabin the number given is 3969, and her crew capacity is 1600. Norwegian Getaway has a total of 18 decks and her normal service speed is 21,5 knots. She flies the flag of the Bahamas, homeport is Nassau. This of course is only her administrative homeport, like her sister Norwegian Breakaway that is homeported yearround in New York, Norwegian Getaway will be homeported yearround in the worlds cruise-capital Miami. The hull-art that was designed for the ship also incorporated the sunny and watery Caribbean, with the main feature being a mermaid who is holding the sun above the waves. The hull-art was designed by David Le Batard, nicknamed Lebo (which signature can also be seen on the ship, luckily not in Peter Max's size on her sister). Le Batard is living and raised in Florida, so he was well chosen for the job and he made a splendid design in my opinion. 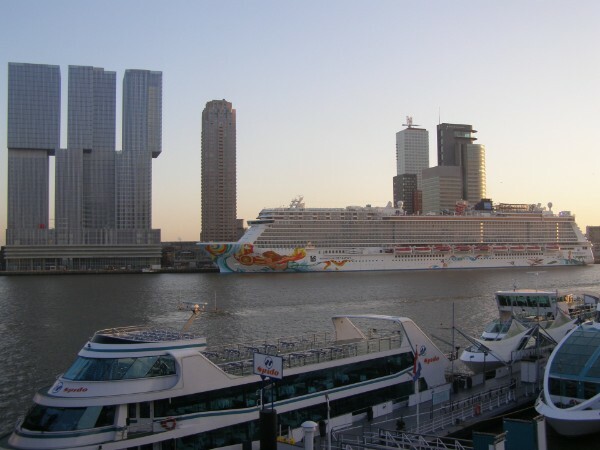 Two newly created masterpieces together, to the right of course is Norwegian Getaway and to the left is the just finished building 'De Rotterdam', created by world-famous Dutch architect Rem Koolhaas. The name of the building, that is of course situated at the old Holland America Quay, is a direct link to the Rotterdam of 1959. Norwegian Getaway has several unique features, of course. There is a combination of dining entertainment in a place called the 'Illusionarium' that is specially devoted for magical and illusion shows. This lounge came in place of the Cirque Dream space aboard her earlier sister Norwegian Breakaway. If you do not like magic stuff, you can also choose for the alternative, a highly energetic show by Burn The Floor. These shows are very Latin-orientated, mainly because of her homeport in the Caribbean. If you do not like that too, you can also see the Tony-award nominated musical 'Legally Blonde'. Next to this, there is also another venue aboard devoted to the Grammy Awards, where Norwegian Cruise Line is officialy partnered to. Here, you can really get into the history of the Grammy's and awe at a jacket worn by the late Michael Jackson, for example. This because, in this space, several items from the Grammy Museum in Los Angeles are on display. Of course, the ship also offers The Waterfront, a part of the open promenade that is built like a shoreside boulevard with restaurants, shops and cafe's. Here, you can stroll and/or eat outside on one of the terraces. Do not worry about the fact if you can eat somewhere aboard, there is the staggering amount of 27 dining options available! You can also bring your kids along, especially when they are into the characters of Nickelodeon. There is a special Kids Aqua Park, devoted to the friends at Nick's from the series Bikini Bottom and a lot of entertainment and special shows from the likes of SpongeBob SquarePants and Dora. The adult Aqua Park offers a total of five thrilling waterslides in bright colours and of course the rope-course, this time painted in wood-like colours. Just like with her sister, at the end of each cruise there will be a gigantic professional fireworks display that will amaze passengers just before they enter the normal world again. The ship also caters well for solo travellers, something Norwegian cruise Line took up from Norwegian Epic onwards. On the new ship, this is taken a step further, as special attention is given to the solo cabins at decks 10 and 11, which are designed in a very modern style of railway compartments. For those travelling solo, for the first time NCL is offering a special lounge devoted to them close-by. Above, the hull-art of the ship can be seen, as well as 'Lebo's' signature. Yes, everything reminding of the name Norwegian Getaway was swiftly locked tight, as the ship was re-named the 'Bud Light Hotel' for one small week. Between the 30th of january and the 3rd of february, the ship was docked next to Pier 88 to act as a hotelvenue for people visiting the Super Bowl XLVIII. The ship became a large musicvenue and bands like the Zac Brown Band and Fall Out Boy performed aboard. Many people living close-by feared that the ship was going to attract a lot of drunk folk and a terrible noise and although this part of town is known as Hells Kitchen, those people were not really keen on this megavenue. And it was not only the ship, also the space between the terminal and the Intrepid Air and Sea Museum transformed into a festival site. 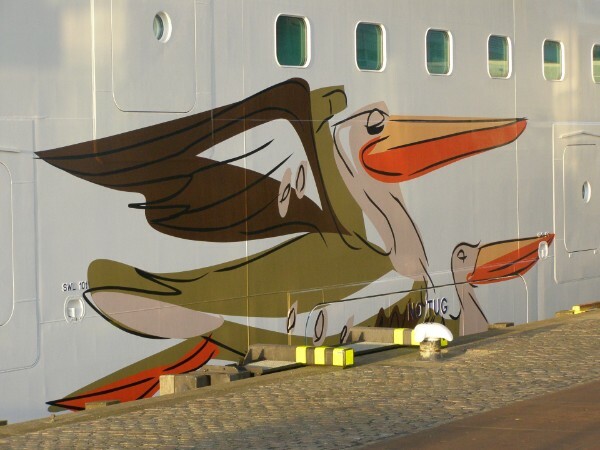 This time, the hull-art is incorporated along the ships full lenght, these birds are near the aft end of the ship, still followed by a palmbeach with lighthouse at the rear. All ended up well, though, the ship finally set sail for her homeport Miami where she was named by the Miami Dolphins Cheerleaders, a group of some 14 great-looking girls. In 'The Old Days' there was normally one Godmother, but this was thrown overboard already by a number of lines. The girls were not chosen randomly, of course. NCL started up a partnership with the Miami Dolphins and is now their 'official cruise line' of the team and the Sun Light Stadium. This Football season, NCL is the main sponsor of the Miami Dolphins and aboard Norwegian Getaway the teams history was to be highlighted in the library with memorabilia, photo's and so forth. Next to the girls, the naming-ceremony was a great spectacle with the attendance of musicstar Armando Cristian Perez (Pitbull) and Tito Puente Jr., who kicked off the ceremony at the ships outdoor theater Spice H20. Also, the cast of Burn The Floor was present too, next to DJ Tracey Young,TV-star Louis Aguirre, D'Angelo & Amanda from 'America's got Talent' and many more. The ceremony was held in three special venues around the ship and when everything became more quiet again, her first cruise departed from Miami at the 8th of february. At the 21st of june 2015, a woman was seen jumping or falling overboard during a 7-day Caribbean cruise and the ship immidiately turned around to search for her. She was indeed found and taken back onboard, and left the ship in St. Thomas, the next port of call. At the 30th of june in 2018, another person left Norwegian Getaway early when a 33-year old crewmember fell of the ship some 21 miles north of Cuba. He was not found and feared dead, but then a day later a call came in from Carnival Glory, that he was found by their ship and treated by their medical crew. He survived the ordeal, but there has to be a simpeler way of job-hopping.